In ancient numerology the number 23 was regarded as a sacred number of magic and enchantment. It's sometimes referred to as The Royal Star of the Lion and it bestows abundant grace and blessing to those influenced by it. 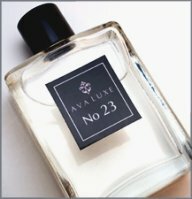 No 23 perfume is a unique blend of Sandalwood, Hawthorn blossoms, Acacia, Rose, Himalayan Geranium , Lavender, and Musk. The floral notes are wonderfully balanced by the rich sandalwood heart, while the musk adds a subtle powdery touch. Magical! I have not, but now you've got me interested! Just when I discovered this line and this wonderful sandalwood fragrance I can’t find it anywhere to buy a bottle. Does anybody knows what happened with Ava Luxe- is she out of business? Thank you. I see though that she is selling just some of the perfumes, in perfume oil version…strange. She seems to put the perfume business on hiatus on a semi-regular basis — that’s all I know, sorry!